Banks and Lee Development, Inc. was a prominent construction and development firm which operated from the mid-1940’s through the early-1980’s. Banks and Lee Development built houses, apartment complexes, office buildings, hotels, shopping centers and schools throughout the Washington DC metropolitan area and neighboring states. William Strang Banks (named after the Scottish painter, William Strang) was born in Scotland in 1904. At the age of 18, Mr. Banks moved his mother and 3 sisters to Toronto to find work. He later moved to New York where he worked in an architect’s office and learned to manage commercial projects. Finally, he landed in Washington DC where he started Banks and Lee Development with a friend. 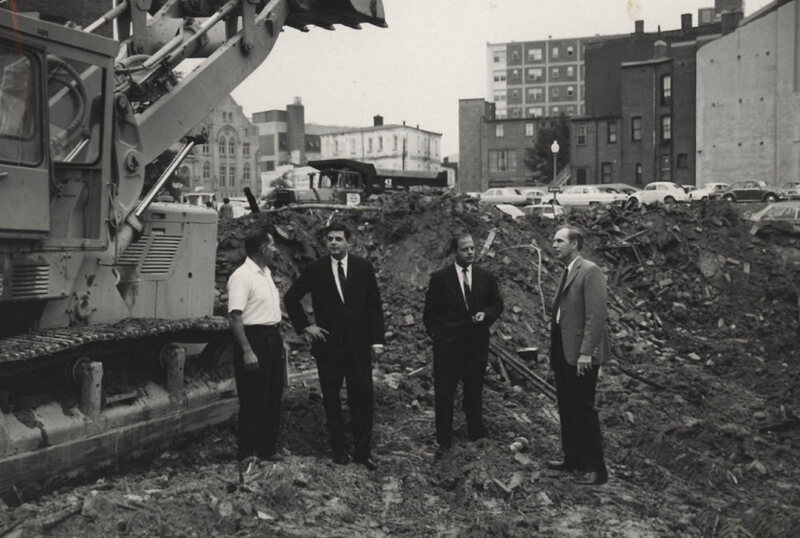 His sons, Bill Banks and Bob Banks (pictured here in dark suits at the future site of the Holiday Inn Central on Rhode Island Ave, NW DC), were immersed in the construction world at an early age. They began as laborers and worked their way up to superintendants. Upon graduating from Harvard and Washington and Lee, Bill and Bob were given the reigns to the company and continued to build its reputation as a trusted leader and innovator in the development community. Today, Scott Banks and Michael Banks (sons of the late Robert Banks) focus on building high quality custom homes and small commercial ventures. Scott and Michael have steadily grown their company and are held in high regard in the building community. They are proud to be the third generation of Banks builders.